SANTA FE – New Mexico Department of Game and Fish employees will be working extended hours and Saturdays this month to help hunters apply for big-game hunting licenses. Information center hours will be from 8 a.m. to 8 p.m. Monday through Friday and noon to 5 p.m. Saturdays from March 10 through March 20. The Santa Fe office will assist walk-ins from noon to 5 p.m March 10 and March 17. The information center will close at 4:30 p.m. March 21. Online applications must be completed by 5 p.m. that day. 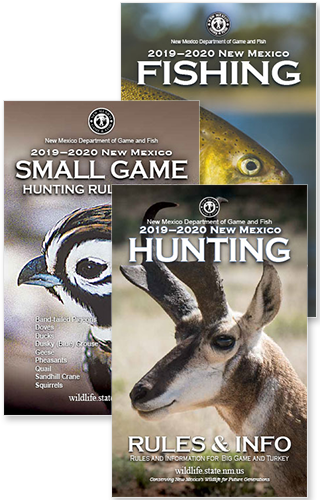 Rules and information about applying for 2018-2019 hunting licenses is available online at www.wildlife.state.nm.us. Printed editions of Hunting Rules & Information booklets are available at department area offices and license vendors. For more information or help applying for licenses, please call the information center at (888) 248-6866. Please have hunt choices and other information ready before calling. The application deadline for big game, including elk, deer, pronghorn antelope, Barbary and bighorn sheep, oryx, ibex and javelina is 5 p.m. March 21. Last season’s harvest reports for deer, elk, antelope and turkey must be submitted by that date and an $8 late fee will apply. Javelina, Barbary sheep, oryx, ibex and trapping license holders must report by April 7. Failure to report by these deadlines will result in rejection of all applications for this hunt season. For more information about how to apply for licenses, please visit the department website at www.wildlife.state.nm.us or see the instructional video on the department’s YouTube channel at www.youtube.com/user/NMGameandFish.